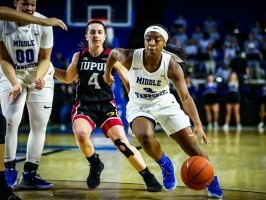 The 2018-19 season and Nick McDevitt era started with a win Tuesday night for Middle Tennessee. 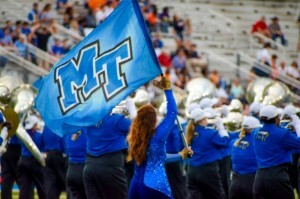 At MT's Murphy Center, the Blue Raiders (1-0) took down Division II Lees-McRae (0-1) 91-69. It wasn't just McDevitt's first win in Murfreesboro, but also his first season-opening win of his six-year head coaching career after going 0-5 at UNC Asheville. Things weren't perfect the whole 40 minutes, but McDevitt didn't necessarily predict them to be with a new coaching staff and several new players. 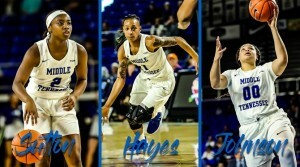 Middle Tennessee only returns 13 total starts from last season and 15.2 percent of its minutes played, seventh and fifth fewest in the nation in the two respective stats. "I thought we came out a little sluggish to start the second half, and then got back on track," McDevitt said. "I think everybody was excited about opening night ... but I thought we were able to play through that stretch in the second half to get the win." 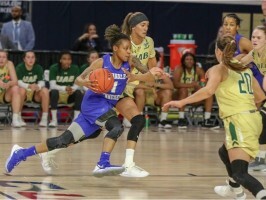 The Blue Raiders turned a 5-4 deficit in the game's first two minutes into a 49-29 halftime lead behind two new faces and a familiar one with an increased role. Redshirt junior Antonio Green poured in 18 of his game-high 24 points before the break, while fellow redshirt junior Reggie Scurry had 11 of his 19. Sophomore Murfreesboro native Donovan Sims had 12 in the first half and 16 for the game, a new career high. Behind Green's 6-of-10 start from the floor, MT shot 57.6 percent in the first half while holding the Bobcats to 29.7 percent (11-37). It was the University of Texas Rio Grande Valley transfer's first in-game action in more than 600 days after redshirting last season. "I was just anxious to play," Green said. "I've been in the gym and just wanted to get back out and compete against other people other than my teammates." Coming out of the locker room after the halftime break, the Blue Raiders got a little loose with the ball. They built a 21-point lead with just under 12 minutes to go, but seven turnovers over the next 5:30 of game time allowed Lees-McRae to claw back into it. "I think we can clean that up just by getting into better shape week by week," Sims said. "We have to take it upon ourselves to be crisper, and we'll get it better. We can't have that many turnovers and win games like that." 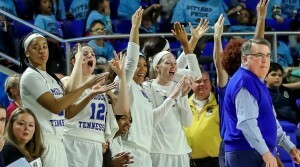 The score was cut to as little as eight with 5:21 left before Middle Tennessee got its act together, ending turnover free in the last five minutes and widening the lead. Senior James Hawthorne came on strong in the final 20 minutes, scoring 17 of his 19 points in the second half on 5-of-7 shooting and 7-for-7 from the free-throw line. Hawthorne added six rebounds, while Green and senior Karl Gamble had seven apiece. Scurry, a Missouri State transfer, had 11 to register his first double-double in Division I action. Scurry hadn't played since Jan. 20 after suffering complications from a whole-body cryotherapy treatment at Missouri State. "At the beginning of the game, I was nervous," he said. "Coming back, it was hard. It was a long journey." 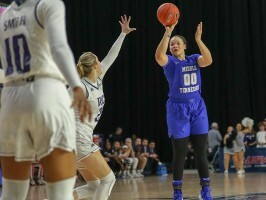 Middle Tennessee did some things McDevitt was happy to see, shooting 55.9 percent from the floor (33-59), winning the rebounding battle 48-31 and hitting 20-of-22 free throws. However, plenty can be cleaned up before the Blue Raiders host Milligan on Nov. 9, including a 15:23 assist-to-turnover ratio. "I think we're doing a good job of moving the basketball and scoring the basketball," McDevitt said. "As long as we can continue to do a better job of taking care of the ball. Some of those turnovers were fatigue turnovers in the second half ... but once we found another gear, I thought we settled in. "It's still really early, but I do like when we're moving the ball what our team looks like." Josh Vardaman is the staff writer for goblueraiders.com. 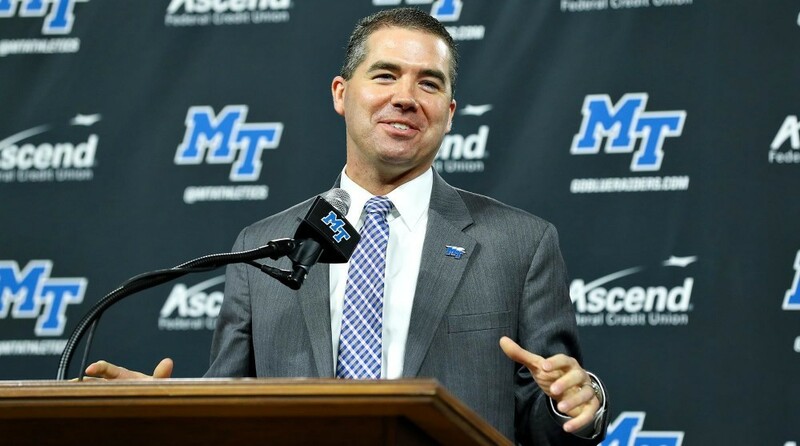 Follow him on Twitter @J_Vardaman and also follow @MTAthletics for more on the Blue Raiders.